I believe that one of the first realizations the Body of Christ needs is to understand who we are in Christ. If we understood who we are…the authority through Christ…the benefits of God’s children…the love and mercy of God…how mighty God is…we would change our outlook, the way we approach adversity, and our expectations when we pray. I still don’t fully understand but God is working on me. 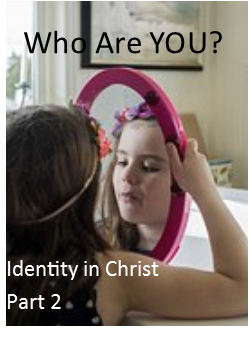 Why does Satan work so hard to strip us from any identity of Christ? You can’t use what you don’t recognize. Pray this over you and your family daily. You are a warrior in the kingdom of God. Fitted, equipped and strong through Christ with every good thing given by our Father in Heaven. Know that you are marked, set apart for the kingdom of God the moment you accept Christ as your Lord and Savior. The helmet marks which kingdom you belong to and which side you are fighting for. Third, you are an overcomer. The head and not the tail, victorious. The Kimg of Glory fights for you with Heavenly Hosts. By the word of your testimony. I was reminded today of a truth that I sometimes allow to fall by the wayside. How do I fight? I fight in the spiritual realms with prayer. 1. We need to speak in faith. 3. Declare what is not yet as though it is. He used words to speak the universe into existence. He needs our words that we speak in faith to change our world. Does your world need a change? Start praying.